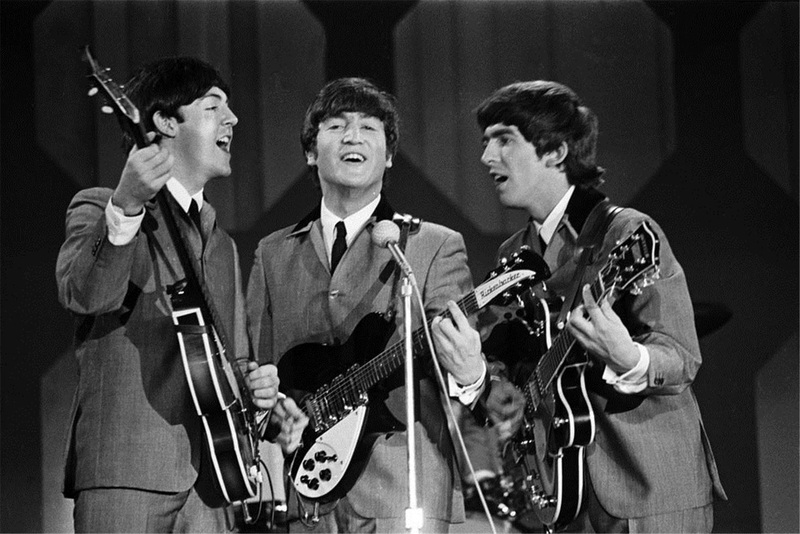 The Beatles first appeared on The Ed Sullivan Show in February of 1964. Although I was just a kid, I’d been listening to rock music for several years before on the local AM radio stations. Most of the artists I liked played guitar. When The Beatles showed up, that did it for me. I had to have a guitar. And every Christmas, The Wish Book aka the catalog showed up in our mail. We received three or four of these from different stores. I turned right to the guitar section and read each description with fascination. Wow that Harmony flat top was made of seasoned wood! It had to be great! Later on, I was able to send away to different companies for their catalogs. I wish I still had them. 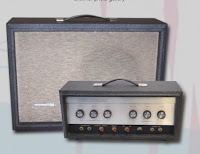 Let’s go back to those days and review some of the guitars, and amplifiers available years ago. Check out the prices too. 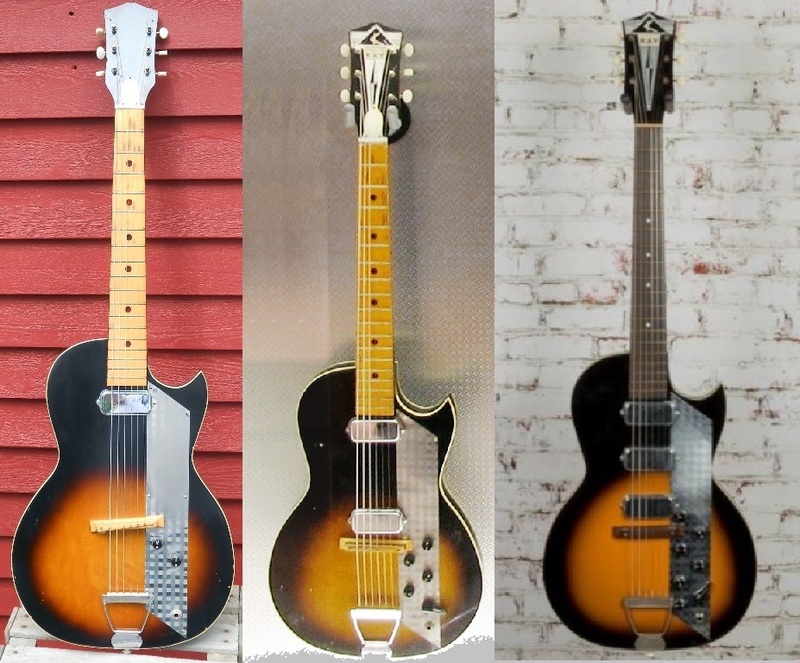 Straight out of the Sears catalog are all of these Silvertone instruments. The two hollow bodies and the two solidbody guitar on the lower right were made by Harmony Guitars. The two teal solidbody guitars on the upper right were made by the Kay Guitar Company. 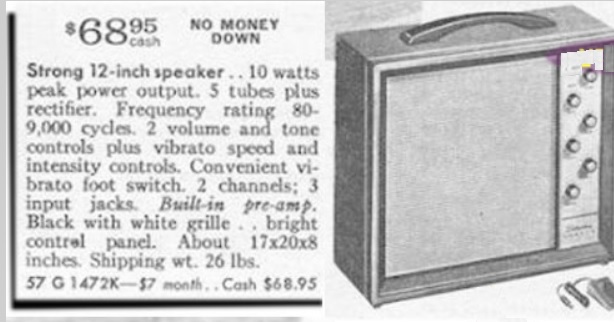 Silvertone was the brand name that Sears had put on their radios, and televisions. They applied it to their musical instruments. 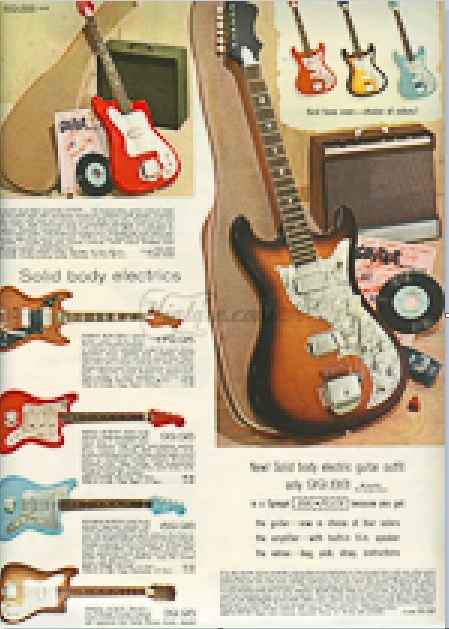 Sears contracted with several different manufacturers to produce guitars, and amplifiers, and then badged them with their own brand. 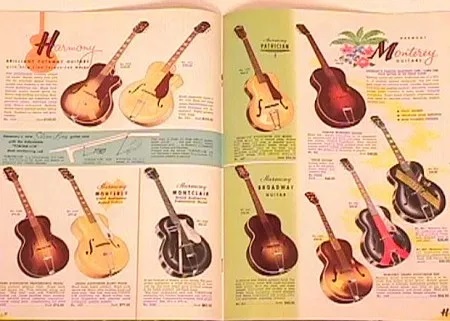 All of these guitars were made by Kay, with the exception of the second one on the top row, which is a Danelectro guitar. The amplifiers on the page were made by National. 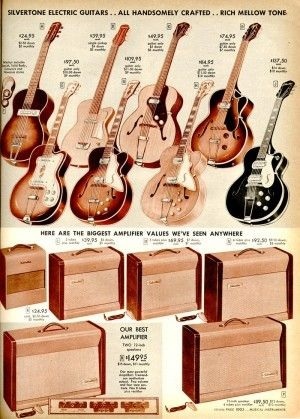 It is a fact that Danelectro sold most of their guitars and amplifiers through mail order retail companies such as Sears. This Silvertone, model 57 1444L bass guitar caught the attention of my best friend, and he purchased it for $99.00 in 1965. I recently saw this same bass at a local music store with the price tag of $800.00. 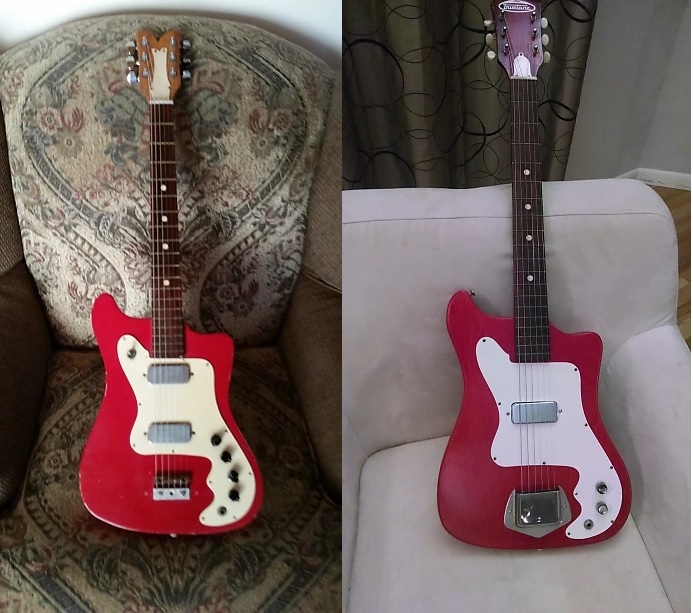 About six month later my friend had saved up enough money to purchase the matching Danelectro-made Silvertone model 1483 bass amp. This amp pumped 23 watts into a single 12" Jensen speaker. 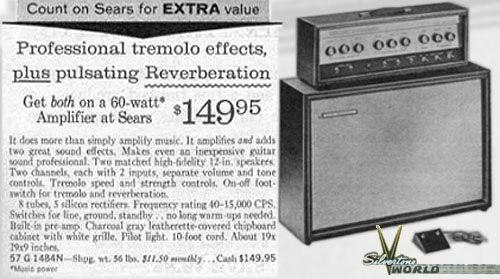 One of the most popular Sears Silvertone amplifiers was what most of us referred to as the "Twin Twelver", although it's actual designation was Model 1484. 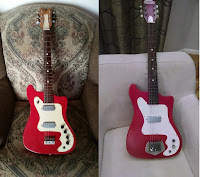 It was made by Danelectro of Neptune, New Jersey. It was much less expensive than a comprable Fender amplifier. 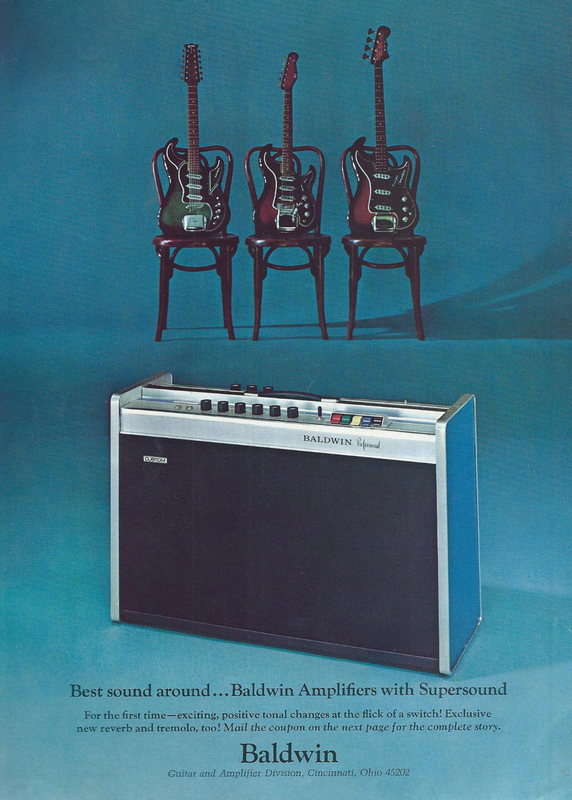 The Danelectro speaker cabinets were made with a compartment in the bottom to store the head for transportation. For those on a budget, Silvertone offered the model 1472, also made by Danelectro. This pumped 10 watts into a 12" Jensen speaker. The Montgomery Ward Company used the brand name Airline for its electronic and music products. 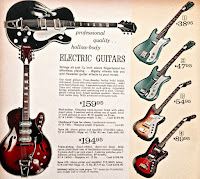 They used a number of "jobbers" or companies for their guitars and amplifiers, such as National, Valco, Supro, Harmony, Kay, All of these guitars were sold by Wards under the Airline brand. 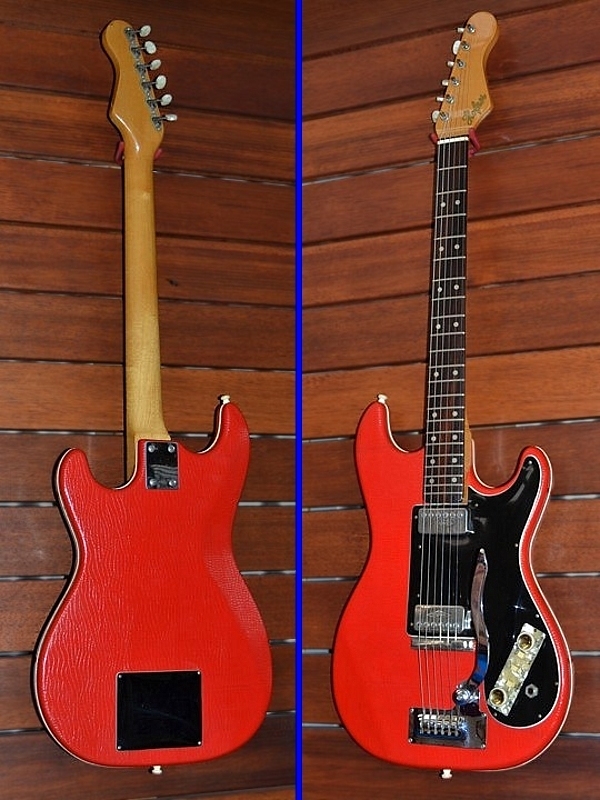 Two Valco made Airline guitars. 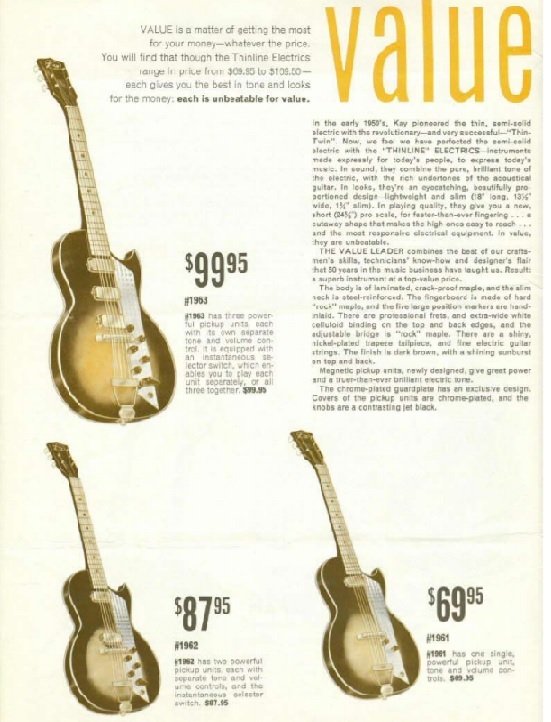 Perhaps the most interesting guitar out of their catalog was the Valco made fiberglass models, which they referred to as "Res-o-glass" for its supposed resonance. There is an interesting history of National, Valco, and Supro. This was a company started by the Dopyera brothers of Dobro fame. Jack White played the JB Hutto model that was first manufactured in 1959. Another one of the more unusual guitars that Montgomery Wards offered under the Airline brand was the Kay Thin Twin. 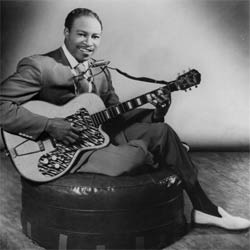 The Kay Thin Twin was the model played by guitarist Jimmy Reed. You can see it in this 1954 company catalog. Most of the other guitars and amps on this page were made by National. A company that has probably been long forgotten was Western Auto. They were very popular in the 1950's and 1960's, and sold guitars and amplifiers under the Truetone brand. 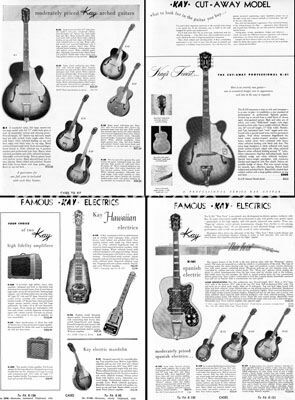 The guitars and amplifiers were made by the Kay Company of Chicago. One of my favorite Kay-made guitars sold by Western Auto was the three pickup Jazz King aka the Speed Demon. It came with distinctive Kay single coil pickups. Each pickup had its own volume and tone control. Some models came with the Truetone decal, while others came with the Western Auto "W" logo. 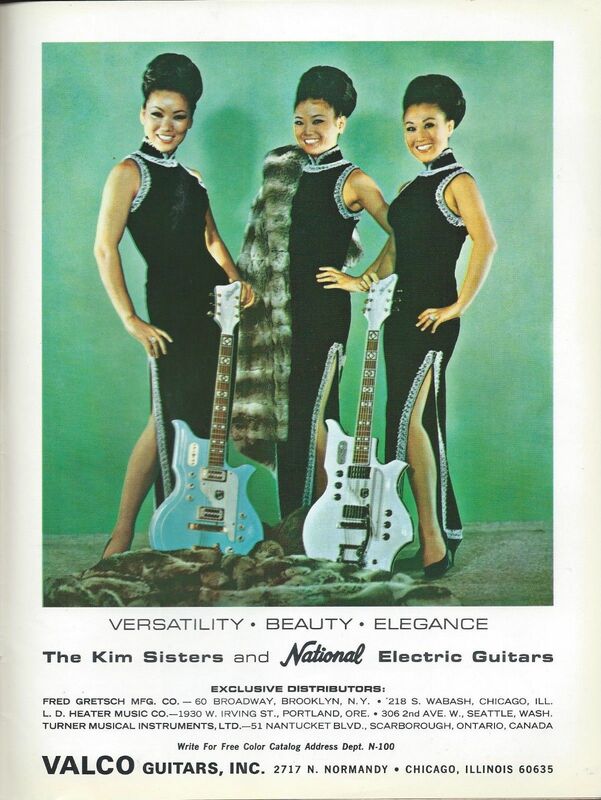 One of the most popular guitars in the 1960's was the Kay Vanguard, you can view it in the lower left corner. This guitar came with one or two pickups, and a fixed bridge with an aluminum bridge cover. 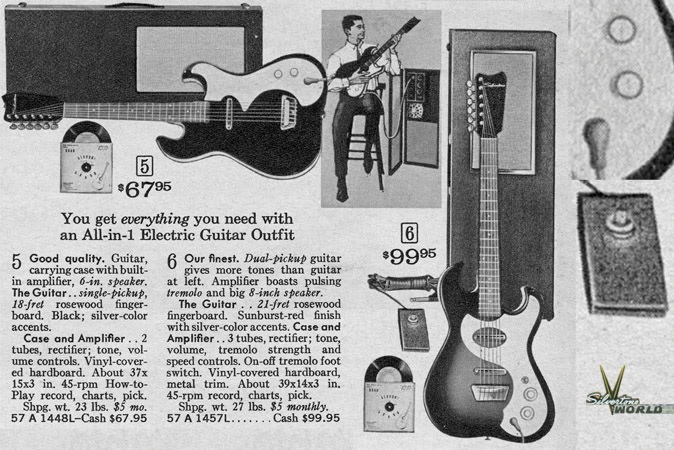 The price for the one pickup model was only $44.95, which was a big factor in the instruments popularity. These were sold by Western Auto, Sears, and under the Old Kraftsman brand for Spiegel. Another popular model made by Kay was called The Value Leader. It was sold through several different catalog companies under different brand names, as well as under the Kay brand. The Les Paul shaped guitar came with a fixed wooden bridge, a rectangular aluminum pickguard, a trapeze bridge, and one, two, or three pickups. The single pickup model sold for $69.95, the two pickup model sold for $87.95, while the three pickup version was $99.95. The pickups were low output to decrease feed back. 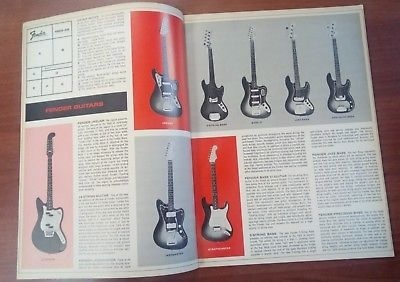 Although Fender guitars were only sold through authorized dealers, you could obtain a Fender catalog from a dealer or directly from the company. 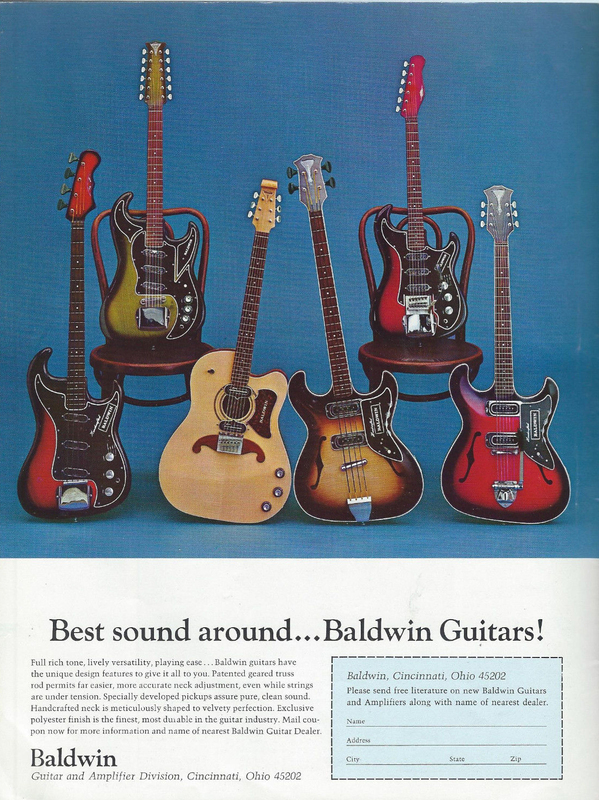 The new kid on the scene in 1966 was Baldwin guitars and amplifiers. 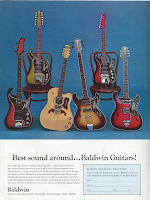 Baldwin had recently acquired Burns of London guitars, and the rights to Kustom amplifiers. 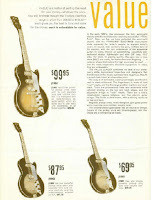 Some of the original Baldwin guitars were still labeled as "Burns", so Baldwin put their logo on top of the Burns logo. The Joseph Speigel Company was a Chicago based business specializing in direct mail order sales. They sold guitars that were made by Kay Guitars of Chicago under the Old Kraftman brand. 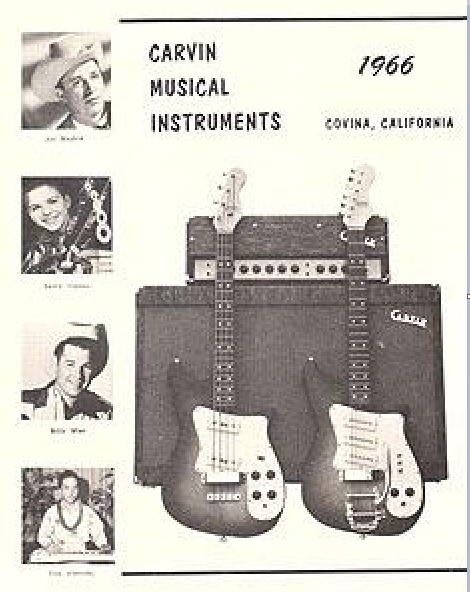 Another company that was offering guitars in the mid 1960's was The Carvin Company of California. 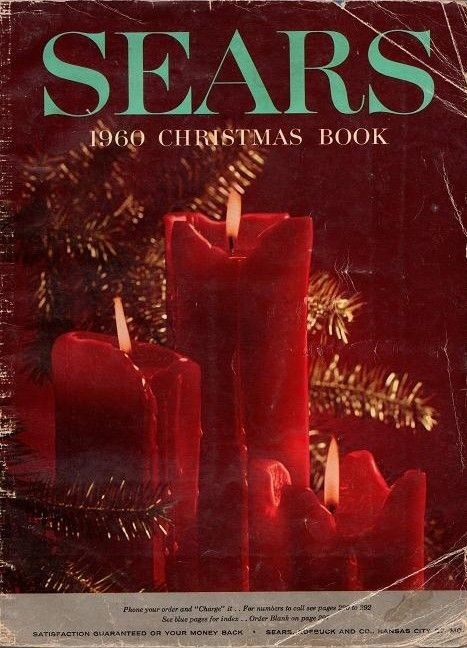 I recall sending for this catalog. It may have cost 50 cents. It was very interesting, and it came with a separate price list written on a typewriter. 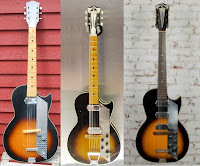 Years later I learned that the bodies of these early Carvin guitar were made by the California based company, but the necks, pickups, and electronics were made by Hofner of Germany. Later on Carvin manufactured their own parts. So sit back and check out these old catalogs. Dog-ear the pages for your selections, and make a wish. I wish you a very Merry Christmas, and Happy Holidays! Click on the links under the pictures for sources. Click on the links in the text for further information. Karl Höfner GmbH & Co. KG, better known as the Hofner Company, has been manufacturing stringed musical instruments for over 100 years. 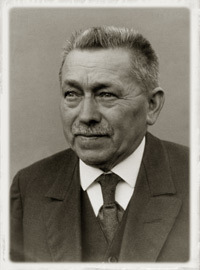 The business was founded by Karl Höfner. Höfner was originally apprenticed to Anton Schaller, who made violins, violas, cellos and double bass instruments. 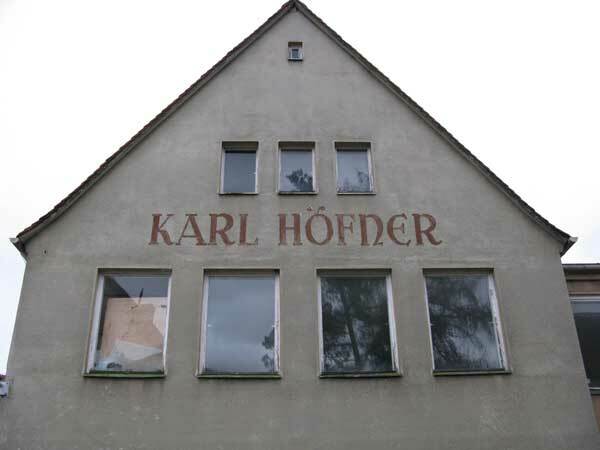 In 1887 Karl Höfner founded his workshop in Schönbach, own instruments and he established quite a reputation throughout Germany, Austria-Hungary, Russia and other European countries. After the first World War he sons, Josef and Walter came into the family business and began the exporting of Höfner stringed instruments into new markets. It was not until the 1930’s that the company ventured into building guitars. The earliest models were steel stringed instrument and all were arched, based on violin design. During these days the company employed around 30 craftsmen and approximately 300 home workers. 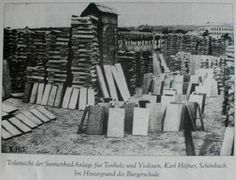 During World War II, production was limited and Höfner was conscripted to make transport crates and shoe soles for the army. At the end of the war, the Czech and German speaking population of Schönbach were expropriated as the result of the company being recognized by the Czech state. This resulted in the acquisition of what was Höfner by the government. 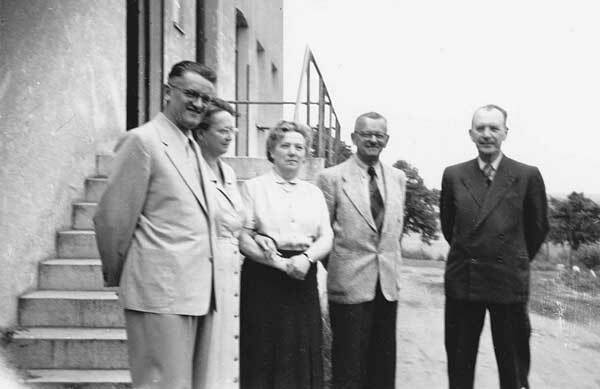 Due to the situation the Höfner family decided to apply for a leave and in 1948 started the the business from the ground up in Möhrendorf, Bavaria. It was a struggle to resume the business since supplies were very scarce due to the war. But Walter and Josef Höfner began working on a way to build a new factory and also find houses in which their craftsmen could live. After extensive negotiations with political leaders, in 1949 Höfner was able to relocate to the small village of Bubenreuth and begin violin making in this municipality and business was resumed by 1950. It was during this era that many of the company’s best known guitars were created. These included The President, The Committee and the model 500/1 bass guitar. It was also during the 1950’s that Rock n’ Roll exploded on the scene. This unforeseen change caused guitar production to swell to 50% of Höfner’s overall business. In the 1950s and 1960s, Höfner instruments were distributed by Selmer of London. 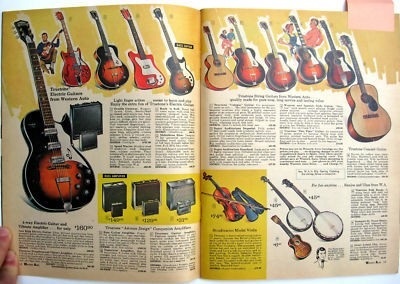 They were considerably more accessible to budding musicians than American-made guitars, which were expensive if obtainable at all, thus giving Höfners a place in history as the "starter" instruments of several well known 1960s musicians. By the 1960’s the demand in Europe for guitars was so strong that Höfner began looking for an alternative to body paint, because it took too long for the paint to dry. The solution (which thankfully did not last) was a shell of the body with printed vinyl. Höfner built a further production site in Haguenau, in order to escape the room shortage in Bubenreuth although also the complex was expanded in Bubenreuth three times. It was in 1961 when Paul McCartney was living and working as a musician in Hamburg Germany. At the timee didn’t have a lot of money and was looking for a nice bass. The Höfner 500/1 was a great fit; he bought one. 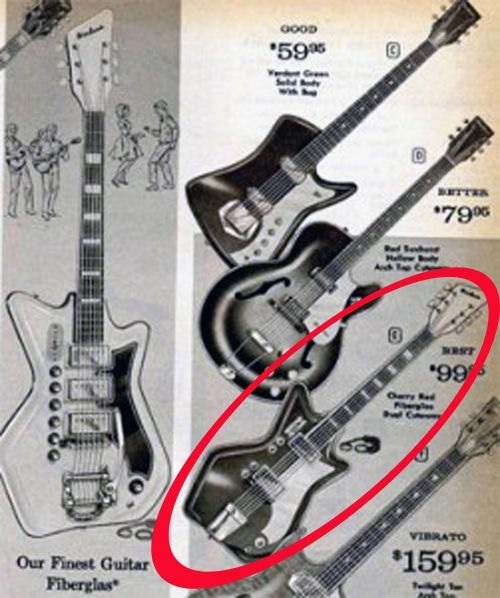 In 1963 he was presented with another, that had a slightly different pickup configuration. This bass was manufactured in 1962. He had no idea that this would become his signature instrument and make Höfner a household word among musicians. 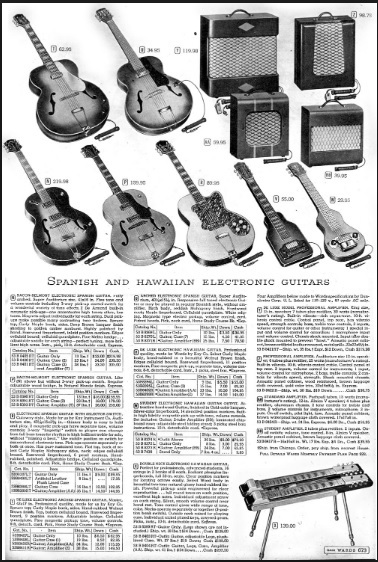 Later in 1961 import restrictions on goods imported from the USA were relaxed and American guitar manufacturers began to take hold in Britain and Europe. This did take away some business from Höfner. Another complicating factor was the proliferation of low priced Asian instruments into the music market. Gerhilde Höfner Benker, Karl's granddaughter and her husband Christian Benker did their best to keep the company competitive, but by 1991 Höfner was sold to the British company Boosey and Hawkes. In their portfolio, there were already a number of musical instruments manufacturers including the bow manufacturer Paesold. By 1995 the two companies merged under the Höfner name. 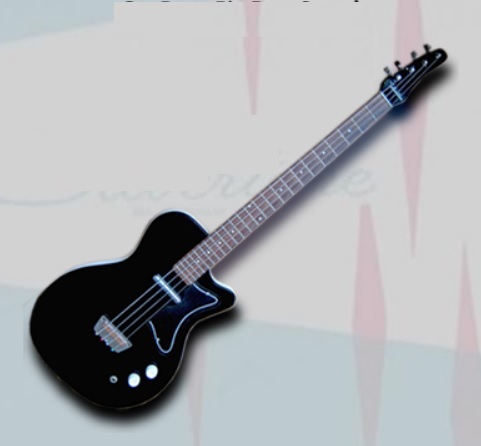 In that same year,1955, Walter Höfner designed an electrically amplified, semi-acoustic bass guitar. The hollow body made this style of guitar very light and easy to play, as well as giving it a rich tone, similar to that of the traditional double bass. The bass was first shown to the public at the Frankfurt Music Fair in the spring of 1956. Sir Paul McCartney relates, "I remember going along to the shop in Hamburg, and there was this bass which was quite cheap. I couldn't afford a Fender. Fenders even then seemed to be about £100. All I could really afford was about £30 ... so for about £30 I found this Hofner violin bass. And to me it seemed like, because I was left-handed, it looked less daft because it was symmetrical. Didn't look as bad as a cutaway which was the wrong way. So I got into that." 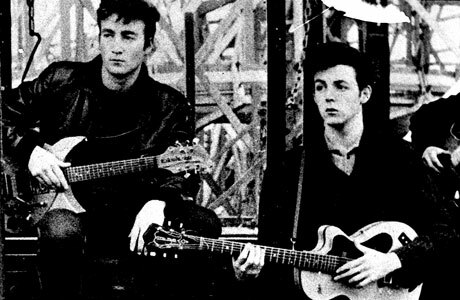 McCartney would acquire two of these models—his original 1961 model, and an updated 1962 model the company gave him in 1963. 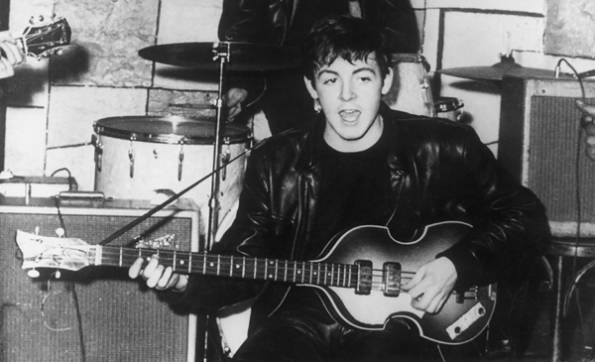 Afterward, McCartney mainly played the 1962 model, leaving the original as a backup. It was in 1964, when he had his 1961 model refinished and had new pickups and an updated pickup surround system installed. He can be seen using this bass in the "Revolution" promo video, strangely with the strap attached to the top of the headstock instead of the neck heel strap button. Sometime during the recording of Let It Be several of the Beatles famous guitars were stolen from Abbey Road Studios. 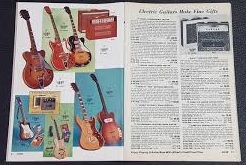 This included the 1961 Höfner 500/1model, George Harrison's Gretsch Tennessean and Harrison's second Rickenbacker 360-12. McCartney used his 1962 model for the remainder of the album. 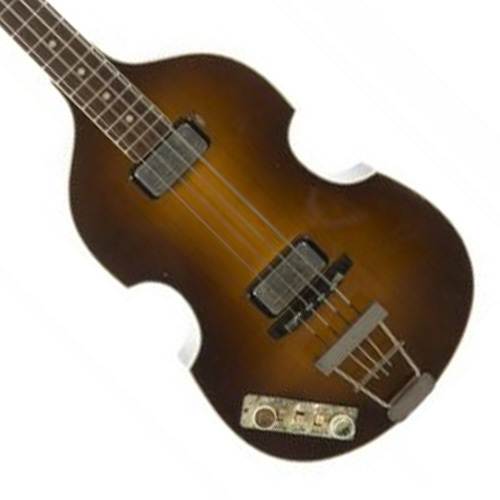 Sir Paul is still in possession of the 1962 bass as of 2014 and used it during the 2014 Grammy's Beatles Special TV performance as well as numerous other appearances. 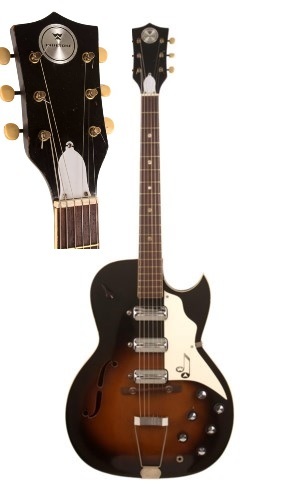 The older model 500/1 Hofner's have no binding on the neck as do most of the newer models. The modern H500/1, as it is currently know is the top of the line Violin Bass. It has a spruce top with flame maple back and sides. The plastic binding on the top and back are black/white/black, while the binding on the sides is white. The bass is hollow with no center block. It is constructed in three pieces. The headstock is the traditional Höfner design with a decal logo. The 3 piece set in and bound neck is made of flame maple/beech/flame maple and joins the body at the 16th fret. It is 21 mm at the nut and widens to 24 mm at the 12th fret. All 500/1 basses come with a zero fret. This bass has a short 30"/76cm scale. The fret board is made of ebony and has white pearl dot inlays. There are dots on the side of the bound neck. There is a white heel cap. The nickel tuners are made by Höfner and fitted with white buttons. The bass's trapeze tailpiece is also made of nickel. The single coil pickups are made by Höfner and are called staple pickups. The electronics panel are produced in house and the potentiometers have a golden colour. The cord jack is on the instruments side. Höfner makes some variations on the H500/1. These include the CT bass, which is quite similar to the H500/1, but comes in sunburst or black. CT stands for Contemporary Series. Note the lack of binding on the neck. The Cavern bass is a copy of McCartney’s original 1961 model. This bass comes with a neck pickup and a middle pickup, while the other 500/1 designs have a neck and bridge pickup. This bass has no binding on the neck and comes with an unusual headstock design. The Mersey model, named after the British town that was home to The Cavern Club where The Beatles and many other bands got their start. This mode has a lighter sunburst finish. The Ignition model comes with different pickups than the others. The finish on this model has a more pronounced red in the sunburst or it can be ordered with a black finish. The unique ECO model has a body finished in and ivory colour. The wood materials are similar, but the neck is topped with a light blue fret board made of a composite material and has black dot position markers. The tuners on this bass are slightly different and are called Rugby Ball tuners. The electronics panel is black with gold knobs. Höfner also continues to build several models of the 500/5 bass, which is now known as The Club Bass. These basses have more of a traditional shape and a rounded cutaway on the body. Except for the body design, the specifications are similar to the H500/1 Violin bass. These basses are offered in several variation; The Höfner Club Bass, which has a traditional sunburst finish, the CT design, which has a black finish, the Höfner Club Bass Limited Edition, which has cream bindings and is finished with violin varnish, so it has a distinct brown colour. The pickups on this model are at the base of the neck and in the center position. There is also a Höfner Ignition Club Bass with slightly different pickups. Stu Suttcliffe was The Beatles original bass guitarist. He played a 1960's Höfner HCT 500/5 President bass. Höfner no longer offers this model. Sir Paul's 1964 Höfner 500/1, which was a gift from the company, was auctioned at Julien's in August of 2013 and the winning bid was $201,800. This Höfner bass guitar was presented to McCartney in 1964 and was displayed at the London music trade show at the Russell Hotel. 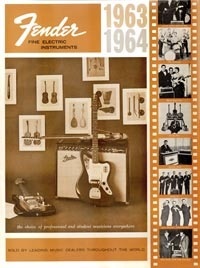 In mid-1965, it was then sold by a Bedfordshire music store to a young bassist. It eventually resurfaced years later in 1994 when it was purchased by an English guitar dealer, who, after extensive research, discovered that the bass was indeed the one bass made especially for McCartney in 1964. This is the same bass pictured above, but Sir Paul added a signed pickguard. The guitar was taken to Höfner in Germany to verify its authenticity. This was confirmed by Christian Benker of Höfner Musikinstrumente. 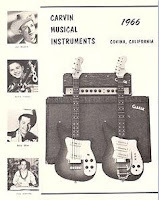 Additionally, Alby Paynter, who worked for Selmer and Co. in London between 1954 and 1967, also examined the guitar and confirmed this was the bass with which he was personally involved clearing through customs in 1964. Additionally, Dave Wilkinson, another Selmer employee at the time, remembered the instrument being on show at its central London shop. This video is long, but it is fascinating to see a 500/1 bass being created.